After 19 Ridge Runs, the Hoka Clifton worked better for the Ridge Run than any other shoe I have used. That is right, on race day, I chose the Clifton over the Nike Wildhorse. Granted, the course surface conditions in 2015 were ideal – dry, but not so dry as to be dusty or loose and pebbly. On the other hand, if the conditions were wet, muddy or snowy, they would have forced me to use a shoe with a more aggressive outsole and I would not be writing this. My feet felt good the whole way – no blisters or battered toes. The Cliftons afford plush cushioning at the expense of a bit of performance, rebound and quickness. I did trip and took a hard fall once. Admittedly that was my fault, not the shoes. It occurred because I lost concentration thinking about how good things were going – irony. The drawback of the Hoka Clifton, is that it is a fragile shoe. After a just a dozen or so training miles and the 20 miles in the Ridge Run, this pair is nearly trashed with limited life left in them. 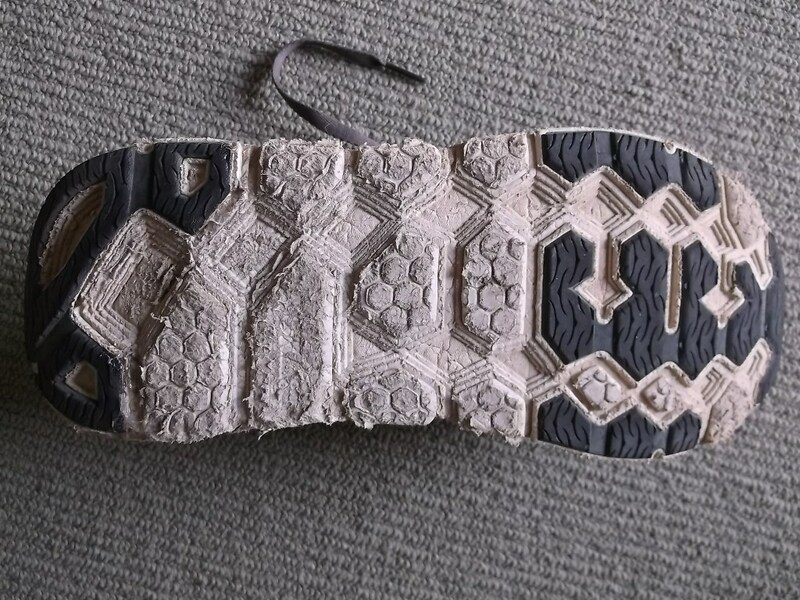 The rubber outsole pieces are already ripping off. From past experience, gluing them back on is only a temporary fix. The welded overlays on the upper have also separated. 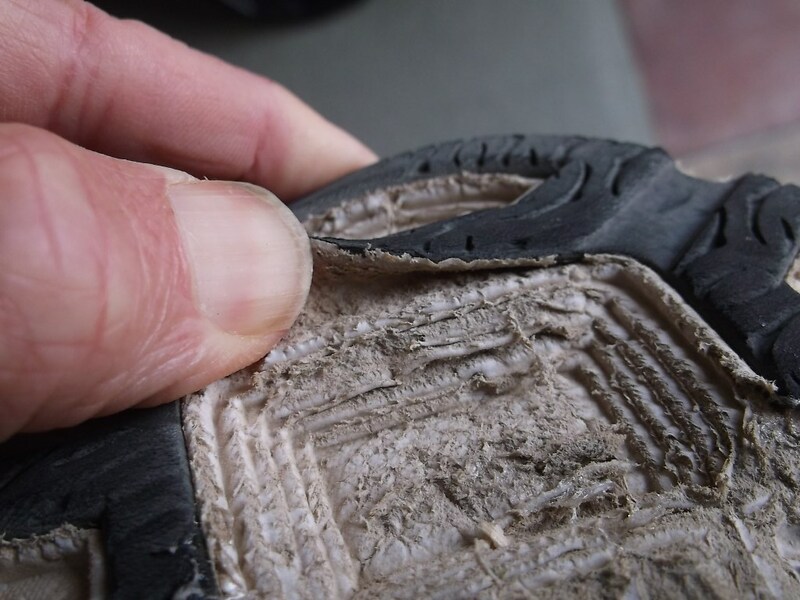 The sole area that does not have the rubber pieces is chewed and shaved from rocks. Deep cuts form in the sole where sharp rocks cut into the soft material. Perhaps the Challenger ATR trail version of the Clifton is more robust, but the rubber outsole pieces only cover the same area, however they stick out more on the ATRs and would probably catch and tear off even sooner than the Clifton’s. There were a couple minor modifications I made to the shoes. In the heel area, I added a make shift rock plate. 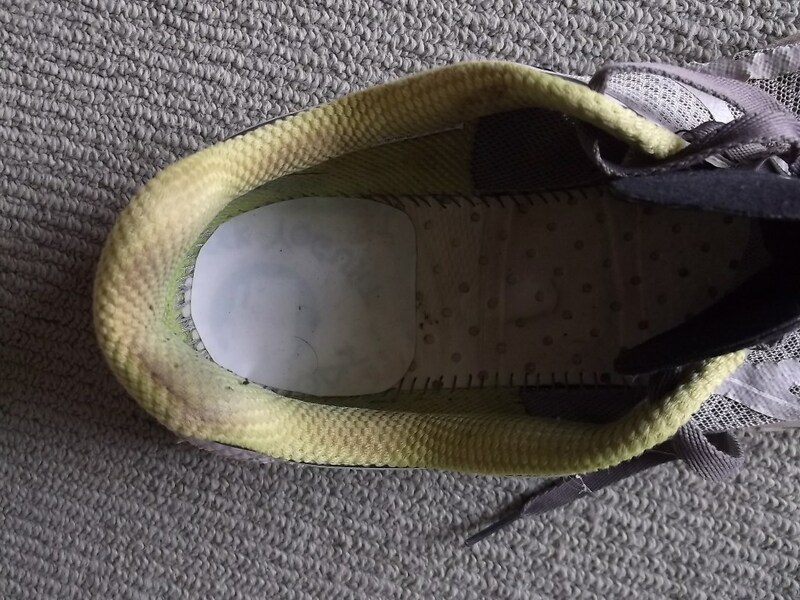 Fabricated out of a plastic Yogurt container, it fit in the shoe under the insole and was held in place with double sided tape. In training, I noticed sharp rocks would poke me in the heel even through the thick Hoka sole. Right under the center of the heel, there is no rubber outsole and a cutaway yielding a less cushioned zone – see previous pictures. This makes the center of the heel a vulnerable spot. This thin piece of plastic as a rock plate worked perfectly. Instead of the Hoka insoles, I used the insoles from my Nike Wildhorse shoes. The Nike insoles have a grippier surface preventing my foot from sliding in the shoe. I also added a partial insole under the metatarsals and arch to give my foot something to grip – Skecher Gorunerize . For smooth trails, the Hoka Clifton is a wonderful shoe just the way it is. For rocky and rugged conditions, it still works, but gets beat up quickly and has a couple vulnerabilities. If I was to make a single change to the Clifton to make it more rock ready, I would add a thin rubber outsole with some small knobs that covered the whole bottom of the foot. Think the old Nike Waffle Racer outsole. This might add a little weight, but it would prevent the need of adding a rock plate and it would add significant durability as there would be no individual rubber pieces on the sole to get ripped off. This entry was posted in Equipment, Shoe Reviews and tagged Hoka Clifton, Nike Waffle Racer. Bookmark the permalink.